Participants in a Cultural Affairs Agency Workshop for Fine Arts and Crafts Repair Specialists receive an explanation. On November 17th, 2016, a party of 34, who participated in a Cultural Affairs Agency Workshop for Fine Arts and Crafts Repair Specialists, visited NRICPT on the belief that it would be extremely useful to take a look at the national center for research on cultural assets in Japan. 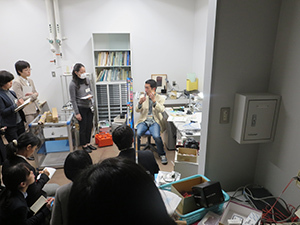 After receiving an explanation in a conference room in the basement, they took a tour to its facilities, such as the Performing Arts Studio and the Physical Laboratory, where researchers in charge described their business activities.